← Grief counseling, or state sponsored religion? For some time, along with two friends Mary and David, I have pondered the problem of spiritual healing. Apart from other types of miracles such as controlling the elements, various types of human inhabitation and incarnation, and transmutation, spiritual healing identifies a flaw in religious belief that I cannot let stand without a few words of deliberate thought. Let me begin with the most flagrant of these irrationalities, that is Leprosy. The following passage is the first law concerning Leprosy. Later accounts in the Old Testament and New Testament have prophets instantly curing Leprosy, or being asked to do so, by waving or laying on of hands. Why this law should ever have a dispensation will not be covered at this time, but make no mistake, the following text is referred to as a “law” (v2). Lev 14:2 “This shall be the law of the leprous person for the day of his cleansing. He shall be brought to the priest, Lev 14:3 and the priest shall go out of the camp, and the priest shall look. Then, if the case of leprous disease is healed in the leprous person, Lev 14:4 the priest shall command them to take for him who is to be cleansed two live clean birds and cedarwood and scarlet yarn and hyssop. Lev 14:5 And the priest shallow command them to kill one of the birds in an earthenware vessel over fresh water. Lev 14:6 He shall take the live bird with the ´ and the scarlet yarn and the hyssop, and dip them and the live bird in the blood of the bird that was killed over the fresh water. Lev 14:7 And he shall sprinkle it seven times on him who is to be cleansed of the leprous disease. Then he shall pronounce him clean and shall let the living bird go into the open field. Lev 14:8 And he who is to be cleansed shall wash his clothes and shave off all his hair and bathe himself in water, and he shall be clean. And after that he may come into the camp, but live outside his tent seven days. Lev 14:9 And on the seventh day he shall shave off all his hair from his head, his beard, and his eyebrows. He shall shave off all his hair, and then he shall wash his clothes and bathe his body in water, and he shall be clean. Lev 14:10 “And on the eighth day he shall take two male lambs without blemish, and one ewe lamb a year old without blemish, and a grain offering of three tenths of an ephah of fine flour mixed with oil, and one log of oil. Lev 14:11 And the priest who cleanses him shall set the man who is to be cleansed and these things before the LORD, at the entrance of the tent of meeting. Lev 14:12 And the priest shall take one of the male lambs and offer it for a guilt offering, along with the log of oil, and wave them for a wave offering before the LORD. Lev 14:13 And he shall kill the lamb in the place where they kill the sin offering and the burnt offering, in the place of the sanctuary. For the guilt offering, like the sin offering, belongs to the priest; it is most holy. Lev 14:14 The priest shall take some of the blood of the guilt offering, and the priest shall put it on the lobe of the right ear of him who is to be cleansed and on the thumb of his right hand and on the big toe of his right foot. Lev 14:15 Then the priest shall take some of the log of oil and pour it into the palm of his own left hand Lev 14:16 and dip his right finger in the oil that is in his left hand and sprinkle some oil with his finger seven times before the LORD. Lev 14:17 And some of the oil that remains in his hand the priest shall put on the lobe of the right ear of him who is to be cleansed and on the thumb of his right hand and on the big toe of his right foot, on top of the blood of the guilt offering. Lev 14:18 And the rest of the oil that is in the priest’s hand he shall put on the head of him who is to be cleansed. Then the priest shall make atonement for him before the LORD. Lev 14:19 The priest shall offer the sin offering, to make atonement for him who is to be cleansed from his uncleanness. And afterward he shall kill the burnt offering. Lev 14:20 And the priest shall offer the burnt offering and the grain offering on the altar. Thus the priest shall make atonement for him, and he shall be clean. 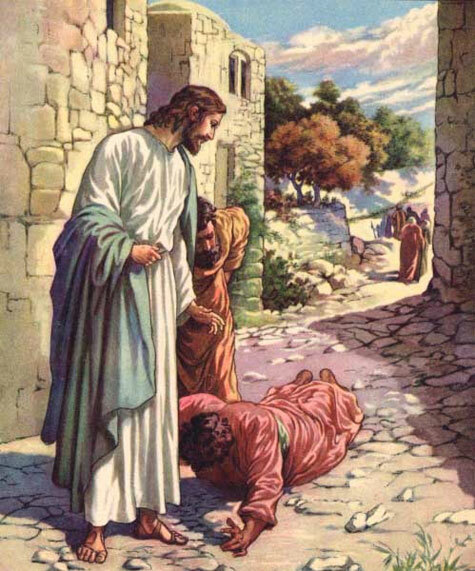 The first obvious problem with this cottage cure for leprosy is that it presumes some manner of sin has ben committed and that the individual feels or should feel guilt because of it (v14, 18). What is lacking here however is any act or class of acts that causes leprosy. Was it murder that was the vector for leprosy? This cannot be so because enemy armies were not struck with leprosy when killing combatant and noncombatant Israelites. Was it some manner of lust? Not according to the story of David. Was it theft, worship of foreign Gods, or bearing of false witness? If so, we have no record of consistent use of Leprosy as punishment. Perhaps then God was not required to specify in any way what act or acts would have led a believer or nonbeliever to contract Leprosy. If this was the case however, it was impossible for a devout yet errant follower to know when an act was so iniquitous as to deserve leprosy. This would surely have made the application of leprosy as a punishment for sin capricious and made any priestly advice about how to avoid leprosy foolhardy. Again remember that the above text leaves no room for Leprosy to be caused by any physical means such as parasites, bacteria, prions, and etc. This is necessarily the case, else a sin offering and a guilt offering would not have been universally required. To be sure, physical ailments were generally seen as such and did not require a visit to a priest and holy intervention. A soldier injured by a sword in war was not required to be healed in any similar manner to Leprosy. Children injured while at play were not presumed to have sinned. Thus what we have as a remainder is the presumption that, since a cause for Leprosy could not be readily identified, some secret factor, sin, must have been the causative agent. In later stories of Leprosy, we see kings and men of valor hoping for prophets to heal them. Why the Levitical cure was closed to them is a mystery. Certainly a king could have paid the Levitical ransom, and a man of valor, even if not a Jew, could have been healed by a priest, especially if that was the will of God. Thus, once again, the story of Leprosy and its attendant law break down due to lack of consistency. It is conspicuous by absence that other maladies have no attendant law nor method for priestly intervention. God claims to have struck various individuals deaf, blind, or mute, and yet, it is not so clearly specified how these individuals could ask for spiritual intercession and be guaranteed a return to health. That is, there is no law for the deaf, blind, mute of lame, even when God claims direct responsibility. Today, the WHO (World Health Organization) has tracked over 14,000,000 cases of Leprosy that have been cured via drug therapy. The therapy continues to evolve from multi drug treatments to potential single drug courses, and the cure takes many months. However, the cure exists and is being rigorously tracked. The primary hindrance is still shame and ostracism of those who have contracted it along with the difficulty of reaching some infected populations. The specific cause is Mycobacterium leprae which is carried by Armadillos, some snakes, and other animals. As the name suggests this is a bacteria. It is slow growing and not as contagious as once thought. Children are more susceptible and prolonged exposure is usually required. Now, due to free treatment, Leprosy is under control in 119 of 122 countries with which the WHO is most concerned, and new case reports continue to fall dramatically. Broadly, there is not much more to say about Leprosy today. It does not take a priestly ransom to cure, and there is no need to speculate about causes. Causes, symptoms, and treatment are well understood. This will not be the first observation that blood rights exposed the practitioner to potential harmful pathogens during and after each ceremony. This suggests one of two possibilities. Either God was watching while sacrifices were being chosen and was guiding the devote’s hand away from any animal with a harmful microbe, or God cast a permanent and long term miracle over all sacrificial animals to ensure clean sacrifices. Since neither of these seems particularly satisfactory, it is certain that when harmful exposure from a sacrifice occurred, it was ignored or ascribed to another cause. Further, the blood sacrifice is not, by far, the first place where quiet chaining of miracles is necessary to achieve a described miraculous end. Next, one should ask what the implications were when a priest required a sin or guilt sacrifice where no sin was committed but healing from a disease was required? In the case of Leprosy, no provision was made for Leprosy to be passed from individual to individual, which implies a fundamental difference in Leprosy then and now. If though, Leprosy was ever transmitted from one person to another through natural causes and priest required a sin or guilt sacrifice as payment for the cure, this was dishonest at best. All other explanations are worse. The worst explanation would have been the priest’s inability to discern what cases were sin cases verses natural causes. Here, the priest was a thief and a charlatan, and the power of God comes into question. After all, the priest is a conduit for God who knows all. Let us then turn to the general biblical narrative concerning sin. If ever one case of Leprosy or any other malady was ascribed to sin and was indeed caused by anything else, the narrative cannot be trusted. This seems extreme, but the narrative internally claims to be authoritative in this regard. The two following verses constitute adequate proof for this article but a more lengthy discourse can be found in Leviticus chapters four through six. Exo. 32;33 But the Lord said to Moses, “Whoever has sinned against me, I will blot out of my book. Psa. 51:2 Wash me thoroughly from my iniquity, and cleanse me from my sin! At a minimum, if we are to believe that Leprosy has a physical and not spiritual cause, it must be concluded that the results of sin are falsely described. Further, if the consequences cannot be trusted, some doubt exists about the concept of sin itself. This places natural law in contraposition to spiritual healing. Perhaps as the most compelling and thought provoking problem of spiritual healing, it must be asked why God never passed along the knowledge to cure any human illness? It might be argued successfully that as we work back toward creation, man was less and less capable of performing the technical acts necessary to prepare chemical compounds required for vaccines and treatments. However, as God was preparing man for his spiritual journey, he, God, certainly could have provided consistent instruction in life sciences. As humankind becomes increasingly more adept at medicine, God and his miracles become more suspect. One solution would have been to partner with man in solving real world problems such as disease, poverty, governance, and etc. and to do so in a clear concise way. Some have suggested that God has done exactly this through providence. Because the same providence provides for eventual cures and ongoing disease, wealth and poverty, oppression and freedom, it is not possible to rationally depend on providence as proof that God is involved in human affairs in any tangible ongoing way. Psa.38:1 O Lord, rebuke me not in your anger, nor discipline me in your wrath! 2 For your arrows have sunk into me, and your hand has come down on me. 3 There is no soundness in my flesh because of your indignation; there is no health in my bones because of my sin. 4 For my iniquities have gone over my head; like a heavy burden, they are too heavy for me. 5 My wounds stink and fester because of my foolishness, 6 am utterly bowed down and prostrate; all the day I go about mourning. 7 For my sides are filled with burning, and there is no soundness in my flesh. 8 I am feeble and crushed; I groan because of the tumult of my heart. 9 O Lord, all my longing is before you; my sighing is not hidden from you. 10 My heart throbs; my strength fails me, and the light of my eyes—it also has gone from me. 11 My friends and companions stand aloof from my plague, and my nearest kin stand far off. 12 Those who seek my life lay their snares; those who seek my hurt speak of ruin and meditate treachery all day long. 13 But I am like a deaf man; I do not hear, like a mute man who does not open his mouth. 14 I have become like a man who does not hear, and in whose mouth are no rebukes. 15 But for you, O Lord, do I wait; it is you, O Lord my God, who will answer. 16 For I said, “Only let them not rejoice over me, who boast against me when my foot slips!” 17 For I am ready to fall, and my pain is ever before me. 18 I confess my iniquity; I am sorry for my sin. 19 But my foes are vigorous, they are mighty, and many are those who hate me wrongfully. 20 Those who render me evil for good accuse me because I follow after good. 21 Do not forsake me, O Lord! O my God, be not far from me! 22 Make haste to help me, O Lord, my salvation! The Psalmist then and many now still believe that the physical condition can be directly attributed to God. These assignments fail the test of credibility. Disease vectors, personal carelessness, misfortune at another’s hands, and similar circumstances are all that is required to explain the negative aspects of the human condition. Conversely, science, personal responsibility, and kindness from others provides progress, as well as happiness. Recently, Christians have accepted the position that Leprosy in The Bible was actually a wide variety of skin conditions and not the Leprosy of today. This new position attempts to reconcile the problem of Leprosy described herein. Even, if such reconciliation is possible, it does not obviate the antithetical relationship between God’s predictability and inconsistent application of punishment for sin. In fact, the situation becomes more indecipherable because multiple maladies are applied inconsistently for an unknown collection of sins. That is, if one does not understand what act required punishment and no specific punishment can be assigned to a particular transgression, it is not reasonable to expect understanding. It should now be clear that Leprosy or any other disease as a product of sin is nonsensical. This requires that the narrative abut sin be disregarded because it claims authority over this subject. Similarly, if a doctor claimed perfect knowledge of a life saving procedure and some subset of patients who underwent the procedure died, the doctor would not be trusted. This is the level of authoritative claim made in The Bible, and consequently, the result is equally necessary. It is time for change. The change that is needed is this. Quit lining the coffers of the charlatans and the incompetent. Let all hands be turned to that which has demonstrated results that are tangible and reproducible. Let us all turn our minds and our resources to understanding the world in which we live and not some vague misguided approximation peddled by those who believe this life worth disregarding. This entry was tagged god, healing, law, leprosy, miracle, wave offering. Bookmark the permalink.